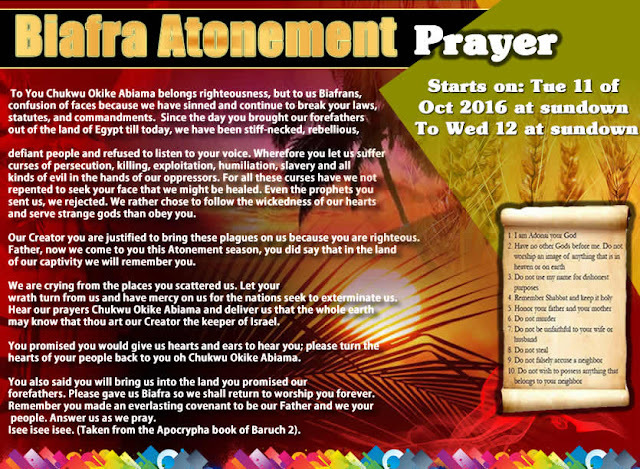 Biafra: Atonement "Starting from sundown Tuesday 11th October to sundown Wednesday 12th October 2016." Biblically, it is endorsed as Ecclesiastes 3:1 pointedly expressed that: to everything there is a season - an appointed time for everything. There is a time for every event under heaven. A time to give birth and a time to die; a time to plant and a time to uproot what is planted.… As a result, this year, on the 11th and 12th day of October 2016 to be precise, Indigenous People of Biafra (IPOB) worldwide, by His grace, will perform the most honorable sacrament, the very prominent act of humility before heaven and earth but well pronounced in terms of the “cleansing rite”- the Biafra Atonement of the year. On Tuesday 11 to 12 October 2016 we will remember that epic moment in our history and pray that the almighty God Chukwu Okike Abiama come once again to our rescue his children from the same forces of darkness that once tried and failed to enslave his children we Biafrans.